Pupils from Charles Darwin Community Primary School visited Weaver Hall Museum for an action packed day of creative writing as part of Northwich LitFest. They met popular children’s author Mark Powers who writes the ‘Spy Toys’ novels, a Toy Story meets James Bond series. Mark gave an engaging talk on his love of writing, read excerpts from the series and answered questions. 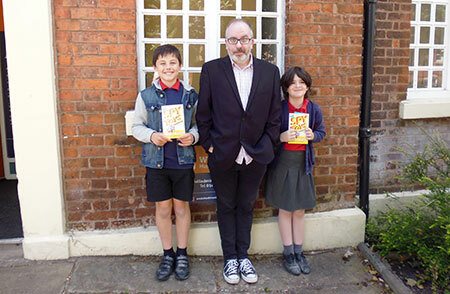 Pupils also created their own short stories to win signed copies of his latest book ‘Spy Toys Undercover’, which sees The Spy Toys disguise themselves as regular school pupils to investigate the disappearance of the world's most famous chocolate factory. During the day, pupils also worked with Museum staff to make clay figures and miniature stage scenes. They used these to create their own stop motion animation during a digital story telling session with visiting staff from Northwich Library. Northwich LitFest is an annual month long programme of events organised by author Susi Osborne. Now in its seventh year the festival has grown to feature 17 events across several venues ranging from local history talks to plays. This is the first year to feature a junior event.